If you follow our blog you'll know we love exploring outdoors in all weathers & when the freezing temperatures hit we can't wait to explore the ice. We've made several ice creations & explored a number of themes including nature, literacy & light with our ice lanterns made from recycled cartons. 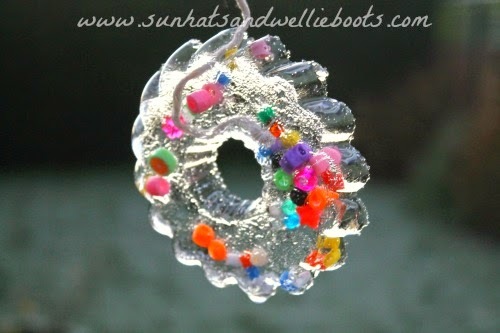 Recently with the temperatures dropping once more Minnie was keen to create some more ice art with silicone moulds & a few beads. We added water to the moulds as before & then added the beads along with a length of string. Before Minnie went to bed we carefully placed the filled moulds on a flat raised surface outdoors & left until the following morning. 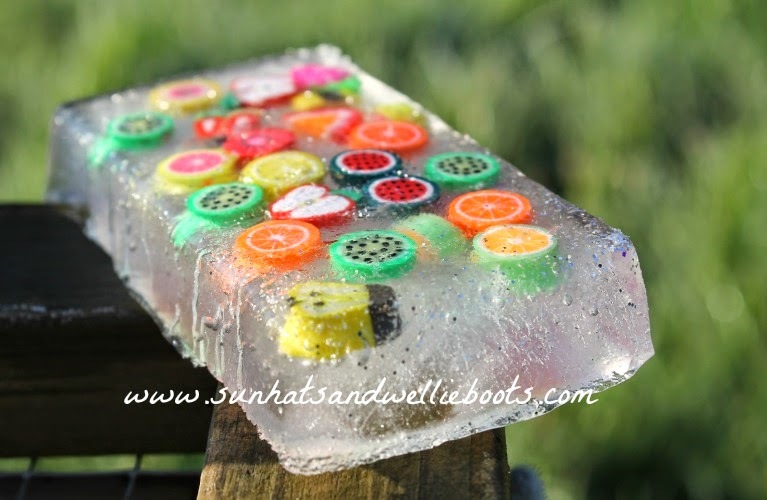 We were pretty sure the temperature would be low enough to create ice, but were quite surprised by just how much of the water had frozen in the moulds. Minnie was delighted to discover her newly created ice art & carefully removed each ice creation from it's mould. 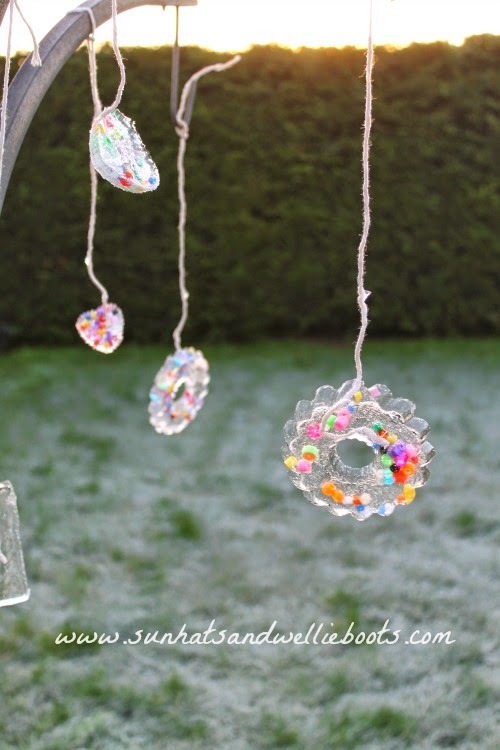 The sun was just rising & created a magical glow around the decorations as she held each one up to the light studying the illuminated patterns in the ice. I had anticipated that these creations would be hung on a fence or nearby piece of play equipment, but my little artist had other ideas. She wanted to create an Ice Tree! Sadly we have no trees within reach in our garden so we used the next best thing... a hanging basket stand!! She quickly set to work tying & winding the lengths of string around the metal stand. As she hung the ice decorations they slowly began to drip which gave us a great opportunity to talk about the differences in temperature & the effect it had had on the water in the moulds during the night & now. 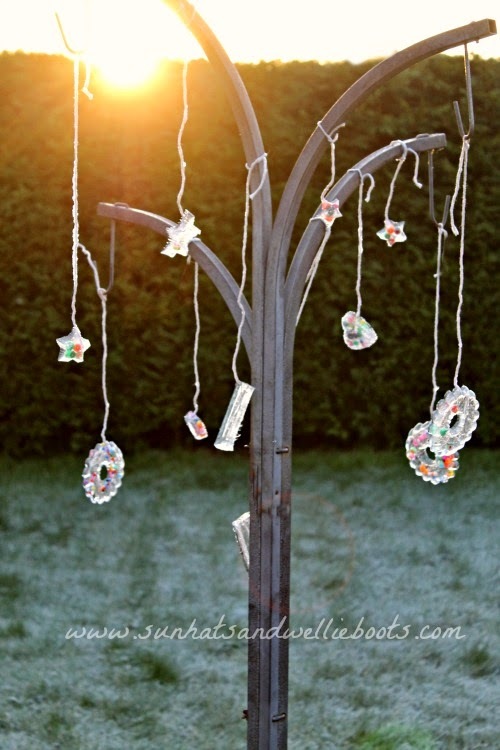 As the frozen shapes glistened in the rising sun Minnie proudly observed her Ice Tree sculpture! I love that she was inspired by the cold weather to create something totally unique & crazily beautiful! She had seen the beauty in the simple frozen shapes & independently created an outdoor piece of art. Sadly the Ice Tree didn't last all day & by the time she had returned from school the decorations had melted. But the magical thing is that there is always another Ice Tree waiting to be created, you just have to double check the forecast for those low temperatures.